Smartphones have brought in so many changes to our life that a day without these hand-held devices is hard to imagine. Right from emailing to chatting, gaming to entertainment, there isn’t a thing that cannot happen via smartphones. However, faxing has till been done the traditional way – by using a fax machine. No matter how mobile you might have become thanks to your smartphone, you had to come back to your workplace every now and then to receive or send a fax. For quite some time now there was a need to incorporate fax sending and receiving applications onto Android and iPhone smartphones. Thankfully, today there are several fax sending apps for iPhone and Androids that work great in a mobile workplace. One of the most popular fax sending apps used by Android and iPhones users, Breezy doubles up as a printing and a fax app. To send fax using the app, users need to collect credits from the Breezy website. Thus while the app can be freely downloaded, the credits have to be purchased separately. To send a fax using the app, you can go to the Breezy menu that will be located in every document and enter the fax number. 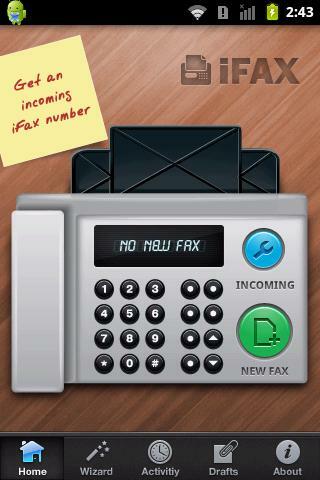 The iFax app can be used for both sending and receiving fax. A freely available app, iFax allows users to import documents from Dropbox, iPhone Mail etc. The app allows you to create a cover page, fill in a few forms, write notes if necessary and send multiple fax at one go. iFax, which works in both Android phones and iPhones, allows users to send PDF, DOC, XLS and JPG files. A simple app that allows users to send and receive apps, the JotNot Fax lets users send PDF documents to fax users in USA and Canada. To send a fax using the app, users will have to access their document through a cloud storage space such as Dropbox and Box.net. Users are required to first retrieve the document from the cloud and then enter the fax number to send the fax. If there is one simple fax app that works great in iPhones and Android phones, then it is Efax. The simple user interface allows users not only to send fax but also receive them within seconds. To start using the app, users need to create an account in the Efax website. The app can be freely downloaded after which credits have to be bought to send fax. Another amazing feature of Efax is that it allows users to insert digital signatures while sending a document through fax. An app that comes at a price of $9.99 has several features. Not only can the app be used to send fax but it can also be used to print, scan and view presentations using the same interface. To send documents that are stored on the cloud, users have to first import them to MobileToolz.